Before we left Canada you could almost smell spring in the air…almost. But, here in Florida everything is in full swing. Asparagus is ready and available everywhere, the tractors are operating to take people to the pick your own sections where the tomatoes and strawberries drip from the plants, and bins are overflowing with a variety of citrus. It’s a preservers paradise! With our trip to Vietnam scheduled for April and May we are likely to miss pickling asparagus, fiddleheads, and wild leeks. Luckily, we don’t have to worry about the asparagus because we are able to do it now. Wash asparagus well and trim each piece to fit in jar. The asparagus should be 1″ less than the rim of the jar. 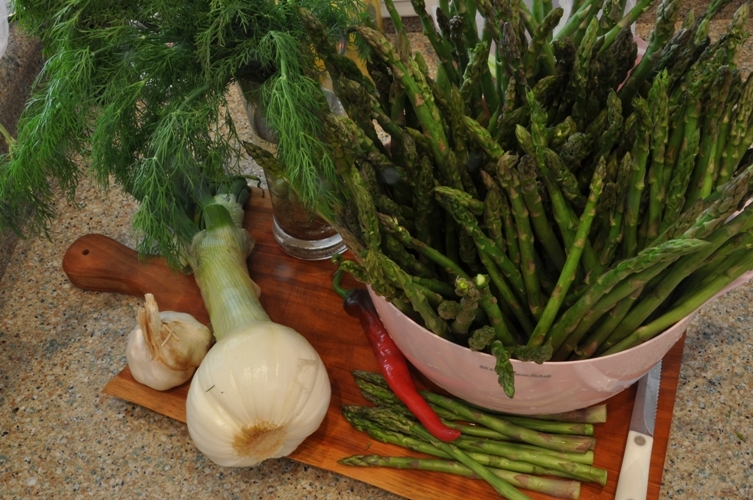 Place asparagus in a large shallow dish or cooler and cover with ice water for 1 hour. Note: this will help to keep the finished product more crunchy. Meanwhile, slice onions and chili pepper(if using) in strips and peel garlic cloves. Prepare for water bath canning. Sterilize jars in the oven at 250F for 30 minutes. In a large stainless steel preserving pan bring vinegar and water to a rolling boil. Place 2 cloves of garlic, 1 tsp mustard seed, 1/2 tsp black peppercorns, and 6 sprigs fresh dill weed, several strips of onion, and 1-2 chili rounds in each jar. 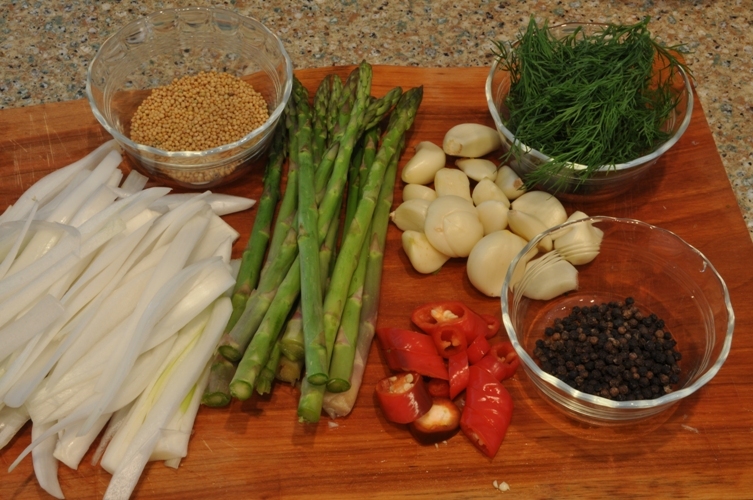 Remove asparagus from brine. 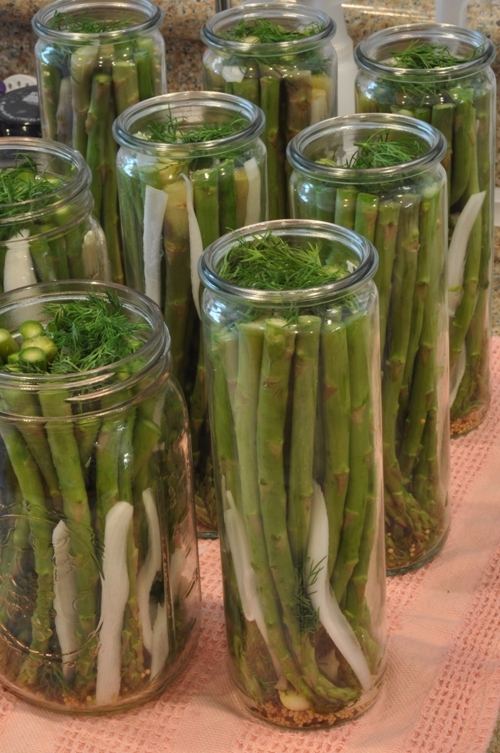 Working quickly, place blanched asparagus into sterilized jars, packing the jars well. (Note: tips down or tips up…it’s up to you. We pack them tips down because it makes lifting them out of the jars easier.) Ladle hot brine into each jar leaving 1/2″ headspace. Remove air bubbles and adjust headspace, if necessary, by topping up with hot brine. Wipe rims using a damp paper towel, center lid on jar and screw band on to finger tip tight. Process for 10 minutes. Remove lid and wait 5 minutes before removing jars. Let jars cool, check seals, label, and store. Admittedly, this was not a complete success. The asparagus shrivelled quite a bit and although we’ve read that happens (and that they may rehydrate) we think that our asparagus was in the processor too long (it took a long time to reach a boil). Next time, we will make sure to keep the jars hot right up until they are ready to be packed and blanching the asparagus will help too. We also think choosing thicker pieces may prevent some shrivelling because the larger the piece the less they shrivelled. We hoped to get a chance to try making these again before we depart home to Ontario but with so much citrus to choose from the asparagus may have to wait. We can say this for sure…despite the fact they are a little stringy (over processed) the taste is great! Pickling anything whether it is asparagus, beans, carrots, or cauliflower is a wonderful preserving project for first time canners. Preparing to pickle any kind of vegetable doesn’t take long and small batches can be refrigerated if you want to avoid processing. We encourage you to spring into action and get ready for another exciting canning and preserving year by trying something pickled! We’d love to hear about how your pickled asparagus turns out? Does it shrivel? And, what are you planning to pickle this year? Any favorite recipes? ← Bitter Heat ~ A Marmalade with Kick! Those are some mighty fine jars!!! We never pickled asparagus before. It looks amazing! Despite the fact that I only made 3 jars of pickled asparagus last year, I still had one left. Like you, I made my pickled asparagus with thin spears and initially, my asparagus were very shriveled and floated in the pickling brine. Looking at the last jar standing, the asparagus did not plump up and so they are still shriveled, although they are not floating anymore. I am surprised to note that the asparagus are still pretty crispy, even though they are shriveled. 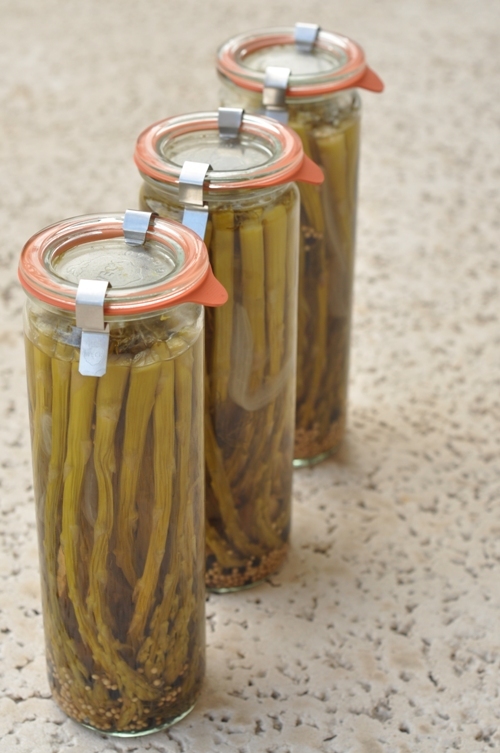 I like fresh asparagus so much that I think I’ll just enjoy it fresh and make dilly beans and dilly carrots instead for my long, thin pickled products. I love both pickled beans and carrots, and they’re both good floating in a drink or sitting beside a sandwich. definately will try, but where in the world did you find those jars? They are fantastic. Thanks for the recipe. They are Weck Jars. Their website is fabulous weckjars.com and they are wonderful to deal with…fast friendly service. They have a great range of beautiful jars. These make pickling asparagus a real pleasure and they don’t take up as much fridge space as the wide mouth Ball jars (which also work well for asparagus). Love to hear how you make out.